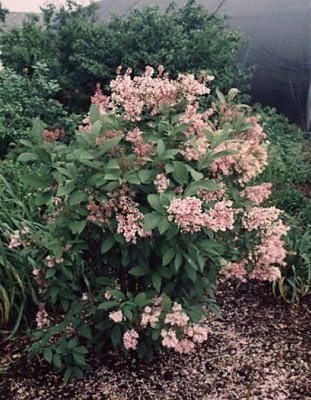 James McFarlane Lilac features showy panicles of lightly-scented hot pink flowers rising above the foliage in late spring. It has forest green foliage throughout the season turning buttery yellow in fall. Perfect as a privacy hedge! 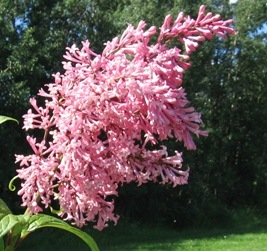 A very attractive and hardy tall accent shrub with upright panicles of lightly fragrant bright pink flowers that emerge in late spring. The brown seeds and smooth gray bark are not particularly outstanding. The shrub has a multi-stem upright habit making it a superb specimen plant or privacy hedge. Its relatively coarse texture and dark green leaves can be used to stand it apart from other lighter shorter landscape plants with finer foliage. 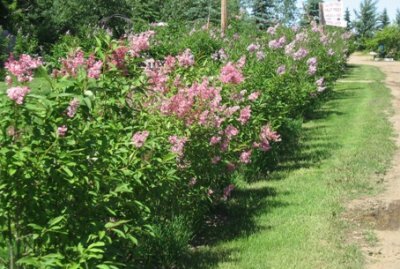 The James McFarlane Lilac will grow to be about 10 feet tall at maturity, with a spread of 8 feet. It tends to be a little leggy, with a typical clearance of 3 feet from the ground, and is suitable for planting under power lines. It grows at a medium rate, and under ideal conditions can be expected to live for approximately 30 years. This shrub should only be grown in full sunlight. It is very adaptable to both dry and moist locations, and should do just fine under average home landscape conditions. It is not particular as to soil type or pH. It is highly tolerant of urban pollution and will even thrive in inner city environments. The Preston Lilacs were developed by Isabella Preston in the early 1920s. Born in 1881 in Lancaster England, she emigrated to Canada in 1912 where she worked at the Ontario Agricultural College (now Guelph University) to become the first woman hybridist in Canada. At her death in 1965 she had developed hundreds of hardier varieties of lilies, lilacs, crabapples iris and roses.